Oddly one side is different to the other. 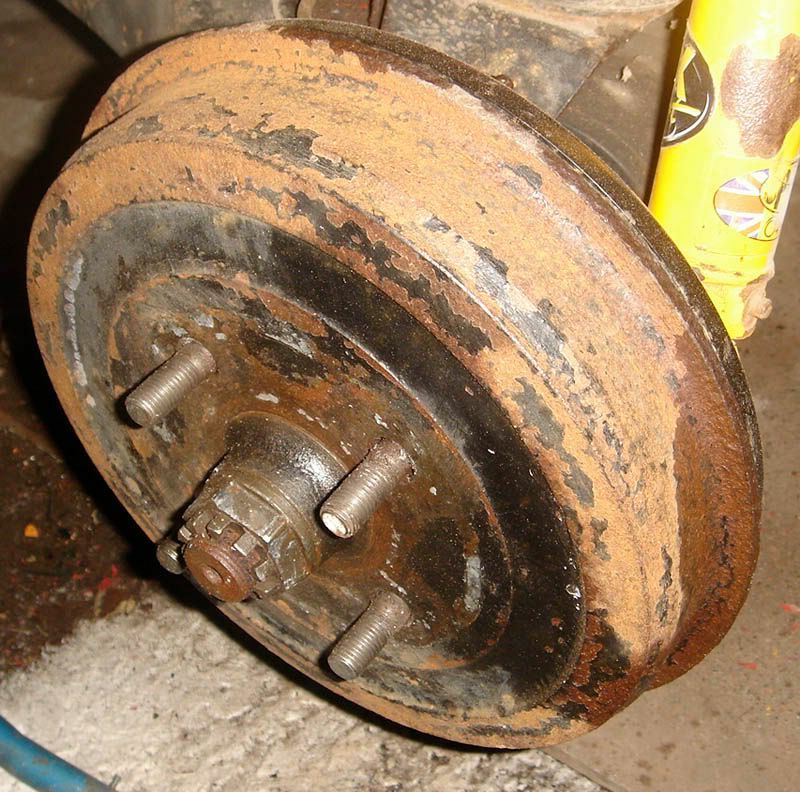 The Nearside rear brake drum appears to be held on with the castlated Nut (36mm). I have got a 36mm socket and tried for love and money to remove it but it won't shift. Yes I am turning it the right way and the split pin was removed. The other side was conventional and of course just pulled off, but damned if I can get the N/S off. Am I missing something? As Paul said, the 36mm castle nut stays on. It may be wear on the inside diameter of the drum from the shoes, leaving some virgin material on the very inside preventing the drum slipping over the shoes. Have you (or even can you) turned the eccentric adjusters to move the shoes in and give clearance? Probably still need the BFH to unstick it. The drum should seperate above the radius. It's probably rusted itself together. As mentioned, hit the area good with a hammer, or try heating it around (above) the radius and keep hitting it. It will give up it's grip eventually. the grease and seals with too much heat applied. ...also knock a chunk off the drum! those stub axle splines and bearing are likely toast. don't smack the backing plate ! I have slackened off the adjusters. I will try hammering the drum. I yes it's got a shoulder preventing it coming off now. Gulp I'll keep trying. Divide the drum into quarters, take a good ball peen and hit the face working in a circle. You generally don't need to beat it up, just good clean hits and it should loosen up. on the hub even harder. to destructively remove it- great big puller, grab the drum edges, and pull. Kills the drum, leaves everything else unharmed. Not to be a nag but you should get new rear drums up front. I'm not sure what prices are like in your area but if you are pulling the rear drums then => you wouldn't be putting them back together with the old shoes and w/o having them turned. If you price it, new drums are not much more expensive then having the old drums turned especially for what you get. With the new drums in hand it would have been easy to see parting lines on the old drums. DONE IT. Whacked it hard on the face in a rotation direction and it popped off. I have been waiting for weeks to do this. Wheel cylinder leaking and full of gunk. This is the last mechanical job to do, then welding and then re-assembly. MOT (annual road test soon).